Posted by John Ruby in Hardware, Network. None of these capabilities are possible with conventional CCTV systems that rely on analog video technology and proprietary, self-contained networks. 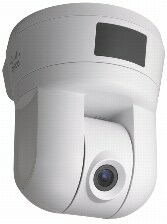 The Cisco PVC300 Internet camera delivers all of them over the IP network you already have in place. With complete video monitoring and management software included, the Cisco PVC300 provides a complete state-of-the-art video solution, at a price small businesses can afford. • Optimal camera control: The Cisco PVC300 features 2.6x optical zoom and a Sony progressive-scan charge-coupled device (CCD) sensor that provides exceptional image quality even in low light. With full pan, tilt, and zoom capabilities, you can remotely monitor your business from virtually any angle, providing a cost-effective alternative to deploying multiple fixed cameras. • Remote accessibility: With an IP surveillance solution, you can access real-time video from any Internet-connected PC or mobile phone, and virtually manage your business’s security and operational efficiency from anywhere. • Advanced application support: The Cisco PVC300 features an integrated speaker output and microphone for two-way audio, as well as input/output ports to support a variety of applications. You can link your PVC300 video surveillance system with door sensors, motion sensors, alarms, lighting systems, phone systems, or virtually any other business system. • Easy installation: The Cisco PVC300 includes easy-to-install ceiling brackets and Power-over-Ethernet (PoE) support, so you can power and control the camera with a single cable. The intuitive graphical user interface in the included video software makes it easy to deploy cameras and sensor systems and set up intelligent alerts. • Included video monitoring software: Other IP surveillance systems require separate video monitoring software that can cost as much as $1500. The Cisco PVC300 includes a complete monitoring suite at no extra cost that lets you easily configure and control up to 16 cameras. • A complete surveillance solution: The Cisco PVC300 is part of a growing family of IP surveillance cameras designed as a fully integrated component of your Cisco Small Business network. With a full portfolio of small business routing and switching, data storage, and telephony technologies, Cisco can provide a comprehensive video, voice, and data solution for your business. • I/O ports facilitate alarm triggers, power lights on/off, etc. Internet Explorer version 5 or later with ActiveX support for viewing, recording, playback, and setting motion detection. Limited support for Safari and Firefox (no motion detection). Increased compatibility with NetBIOS over TCP/IP, SMB, CIFS, etc. FCC Part 15C Class B, CE, UL, EMC/EMI Part 15B Class B for U.S.
Cisco® Small Business Video Surveillance products provide customizable ways for small business owners to monitor and protect their companies. These high-quality solutions can be optimized for many different applications and sites. 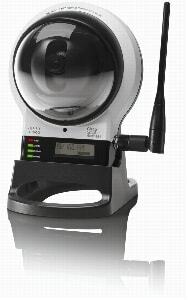 The Cisco WVC210 Wireless-G PTZ Internet Video Camera (Figure 1) sends live video through the Internet to a web browser anywhere in the world. The camera supports dual codecs (MPEG-4 and MJPEG), which can be used simultaneously. MPEG-4 gives efficient bandwidth consumption with good-quality compression and is optimal for real-time viewing of video. MJPEG gives optimal video quality, making it ideal for large-volume storage to a network attached storage (NAS) device. The Cisco WVC210’s audio capabilities include two-way audio, an embedded microphone, external speaker and microphone ports, and voice compression. With extensive support for features such as IP multicast, Real Time Streaming Protocol (RTSP), Real Time Protocol (RTP), and 3rd Generation Partnership Project (3GPP), it enables video to be viewed from multiple endpoints and client applications, such as 3G phones and QuickTime clients on PCs or Wi-Fi phones. Network protocols such as 802.1p priority, 802.1Q VLANs, and Dynamic DNS (DDNS) are also supported. The WVC210 can also be managed securely using HTTPS. The pan/tilt and digital zoom functions allow you to remotely control the camera movement and focus, giving you maximum remote flexibility. Up to 10 simultaneous unicast users can access the camera at any time. Video monitoring software is included for monitoring multiple cameras and recording to your hard drive, with advanced search by time and date. Recording can be set up to start by motion trigger or by manual or scheduled recording. Playback is available on Windows Media Player, with no need for a proprietary player. You can also enable security mode, which tells the camera to send a message with a short attached video to up to three email addresses whenever it detects motion in its field of view. You can then log in to the live video stream if the situation warrants. Wireless security features include Wired Equivalent Privacy (WEP), Wi-Fi Protected Access (WPA), and WPA2.